Free Shipping Included! 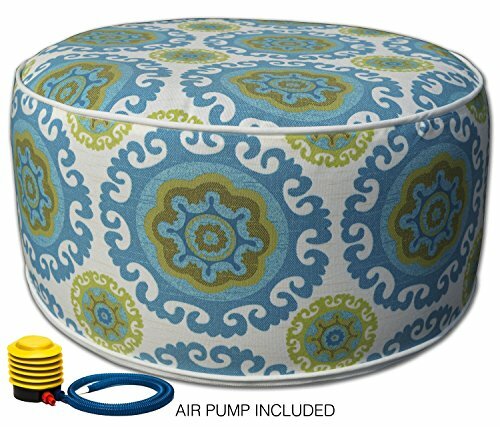 Kozyard Inflatable Stool Ottoman Used for Indoor or Outdoor, Kids or Adults, Camping or Home (Blue) by Kozyard at Go Plots. MPN: KZIOBLU. Hurry! Limited time offer. Offer valid only while supplies last. Rest your tired feet on this portable, inflatable ottoman! Sporting a unique, bohemian print, it brings style, comfort and fun to any outdoor space. Rest your tired feet on this portable, inflatable ottoman! Sporting a unique, bohemian print, it brings style, comfort and fun to any outdoor space. Ideal for patios, pools, decks, vacation homes, or even camping, our multifunctional ottoman can be used as a seat or footrest. Its made of water-repellent, fade-resistant polyester and measures 10-inches tall with a 23 inch round, cylinder design. The inflatable stool ottoman is easy to clean, sturdy and holds air for a long time. Kick back and relax during outdoor parties or barbeques, or just while surfing the net and loading up on your vitamin D. The portability of this inflatable pouffe also makes it ideal for college dorms and travel. PACKAGE INCLUDES 1 x Inflatable Stool (Grey, Quatrefoil Lattice) + 1 x Filling (25u, Thick PVC explosion-proof liner), 1x air pump. Soft Package with PVC handle bag. Great as a footstool or seat. AIR PUMP FOR EASY INFLATING One easy-to-use inflating air pump is included, use your foot to operate the pump and inflate your stool. EASY TO CARRY Very practical and convenient to carry, specially designed with double string piping and handle, zipper on the bottom of the ottoman, folded design for portability, solid and durable. Ideal for travel, home, etc. SAFE DESIGN Safe for children at any age. Bears up to 300 pounds, coordinates with lounge chairs. VERY DURABLE Upholstery fabric is 200gsm spun poly. Internal liner is 25U PVC material to ensure lasting durability. The upholstery fabric is very easy to clean and maintain. If you have any questions about this product by Kozyard, contact us by completing and submitting the form below. If you are looking for a specif part number, please include it with your message.